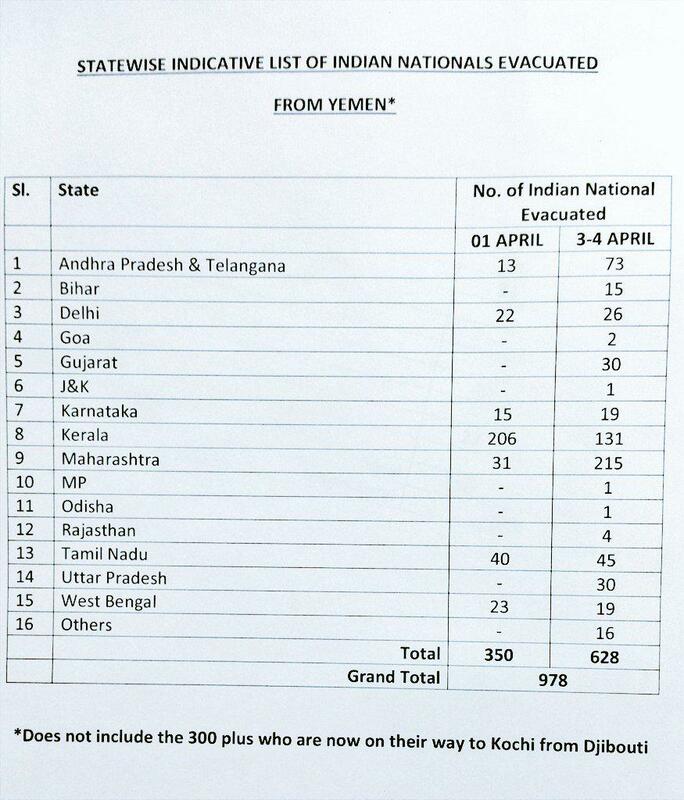 New Delhi(PTI): India on Sunday evacuated 670 more nationals, including 488 from Sanaa by three Air India flights, taking the total number of Indians rescued from war-ravaged Yemen to nearly 2,300 after the "largest" evacuation in a day so far from there. External Affairs Minister Sushma Swaraj thanked Air India for its massive effort in operation 'Raahat' to pull out Indians trapped in several parts of Yemen amid raging fighting. "Air India conducted three successful flights out of Sanaa and evacuated 488 Indians. It was the largest evacuation so far," the Spokesperson in External Affairs Ministry said. He further said that 203 people were evacuated from Ash Shihr-- 182 Indians and the rest from seven other countries-- by Navy vessel INS Sumitra. Earlier, Swaraj had also tweeted that in a humanitarian gesture Indian Navy evacuated three Pakistani nationals from Al Hodeida by INS Sumitra. "Pakistan also brought 11 Indians from Al Mukallah... On Saturday, Indian Coast Guard saved 10 Pakistani crew members of Omani warship," she said in her tweets. Navy officials said the 203 people were rescued from Yemen's Al Mukallah city, which has fallen into the hands of al-Qaeda, amid "grim" conditions. The evacuees were being taken to Djibouti from where they will fly back to India in an Indian Air Force aircraft. INS Sumitra could not make a stop in Al Mukallah port on Saturday and hence it was diverted to the nearest port which was Ash Shihr port, about 25 kms east Northeast of Al Mukallah. The Indians from the fallen city were moved to Ash Shihr port from where they were transferred to the Navy vessel using smaller boats under Operation Raahat, defence sources said adding that the conditions were difficult. Due to the security situation, INS Sumitra had anchored about three kilometres outside the port. "INS Sumitra is expected to reach Djibouti tomorrow noon. Situation in the area remains grim and as per last reports. All Indians have been evacuated from the Mukallah area," a Navy official said. Official sources said the evacuation operation was going on notwithstanding the deteriorating situation across Yemen. "We hope to complete the evacuation operation in the next few days," they said. A no-fly zone enforced in Yemeni airspace by international coalition has made it difficult to evacuate Indians by air, they said, adding India has been requesting Saudi Arabia to allow aerial sorties to Saana on daily basis. The sources said the number of Indians across Yemen was around 5,000 out of which 1,000 were women married to Yemeni nationals. The number of Indians in Saana would be around 3,000 while around 554 were in Aden and 298 were in offshore oil fields.